A few months ago we discovered we had booked a hotel close to a rail bike after doing a facebook check-in and seeing 레일바이크 (Korean for rail bike) in the list of choices. We went and I have to say that rail biking was just as fun as I had imagined… I loved it! As soon as I posted a photo of my experience on my blog’s facebook page, I immediately had people wanting to know how they could rail bike too. Rail biking is a very popular thing to do and the tickets do book up sometimes days in advance. We highly recommend booking tickets ahead of time. I wouldn’t count on being able to buy tickets the same day you want to rail bike. In fact, we have had several experiences trying to do just that and being turned away. Each location varies, but expect to spend about 10-15,000 won per person and the ride is usually anywhere from 20-45 minutes. The following list is sorted alphabetically by province. 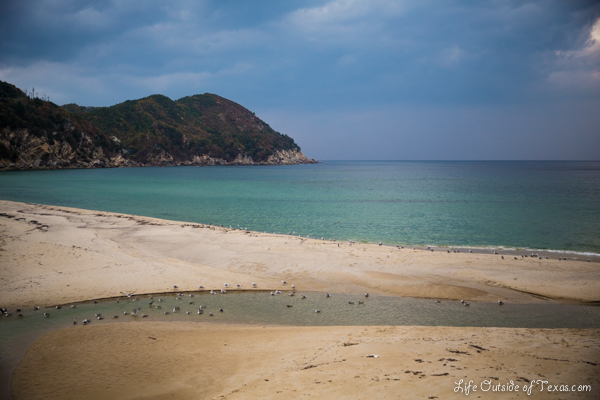 This entry was posted in Chungcheongnam-do, Gangwon-do, Gyeonggi-do, Gyeongsangbuk-do, Jeju Island, Jeju-do, Jeollanam-do, Wonju and tagged adventure korea, korea tourism, korea tourist attractions, rail bike korea, things to do in Korea, tourist attractions in south korea by Meagan & Dave | HappilyEverExpat.com. Bookmark the permalink. 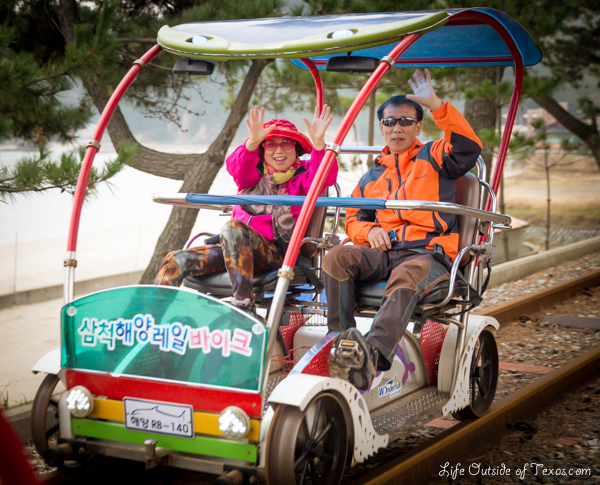 Yeah, we stayed overnight in Wonju and found a rail bike really close by. Since then we have also rail biked in Samcheok and it was beautiful! I’ve seen photos of rail biking in the snow in Gangwon-do and it looks absolutely amazing as well. I think it’s something you can enjoy year round. 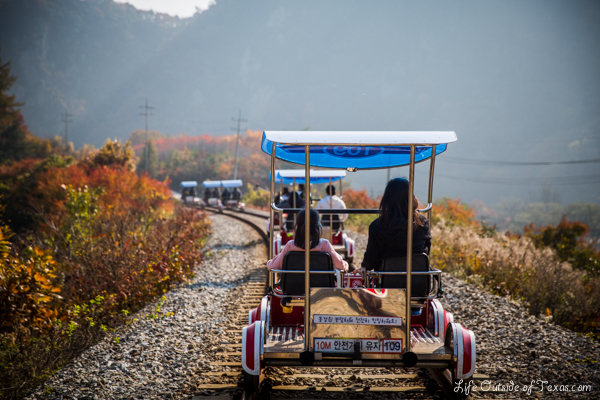 Well dear, if you have a plan to visit Nami Island or you’re going to visit the island in near future, then Gangchon Rail Park is the best option for you to have some rail biking experience. It is closer to Nami. I didn’t even realize this was a thing. That’s it, I will simply have to come back to Korea in oder to try out this awesome looking activity. I was thinking, for being such a small country, Koreans sure know how to pack in a lot of fun in the space that they have. There is a Railbiking trail in Jinju as well that runs along the river. It goes through a tunnel or two as well. Thanks for letting me know! I’ll try to look it up. I need to stop reading posts about Korea, they make me want to go back so badly! That looks really fun and there was one near where I lived. I wonder how long it has been around, I never heard of it when I was there 2009-2010. Awesome list! I had no idea there were this many places you could go to rail bike. I only used the ones in Samcheok which were (surprisingly for me) super fun! If you’re a drinker, don’t forget to bring a beer (or two) for the relaxing ride since you don’t need hands to drive! AH! That grasshopper cafe is right near Auraji, my favorite place to get away from it all in all of Korea! We went there and got some overpriced coffee 🙂 Great advice about booking early, when we tried to go they were fully booked for the entire day. Big bummer, but they gave us a free ride on the train, so we couldn’t complain! Omg I want to do the beach rail bike SO BAD after reading this!!!! Adding this to my Korean bucket list ASAP. Thanks so much for sharing! I shared this immediately after reading it the first time and now that I’m coming back and leaving a comment, I feel the need to share it again. I did the Yeosu one not long ago on a dreary looking day but seeing the ocean while pedaling away on the tracks is pretty cool. I like that this is popping up all over Korea. Good stuff! Thanks for sharing. This. Is. Amazing! I did not know what rail biking was until you posted about it a few months ago. Since I saw that post I have been obsessed with finding a rail bike. I almost went to the one in Chuncheon a few weeks ago, but it was so dang cold and we didn’t book tickets, plus I wasn’t even sure if it was open. You can bet as the weather warms up I will be finding these gems…thanks for the very informative post! It’s actually the first time in my life that I hear of rail biking! It was a good choice to click on that random link on Facebook, you opened up a completely new scenario. It would be amazing if in the future there would be any long distance rail biking opportunities: imagine in example biking all of the trans-siberian way! Clearly just a dream, but maybe some unused railway around the world could be reused for recreational purpose. Well that didn’t take long for me to find something else on this blog that interested me. Rail Biking huh! My wife and I are suppose to be coming to Korea for a visit this coming September. I should contact the people we are going to be staying with and see if there is a place he knows about. I don’t know enough about South Korea to know, but maybe there is one close to Osan AB near Pyeongtaek. What is the Won rate these days anyway? Wow, I never tried a rail bike before, it seems a truly amazing experience. I hope I can go there this summer. hi! thanks for the informative information. Do you know which rail bike is nearest to Seoul ? Hi, so glad you found the post informative. I’m not exactly sure which is easiest to get to from Seoul. I always lived in the southeastern region of Korea. 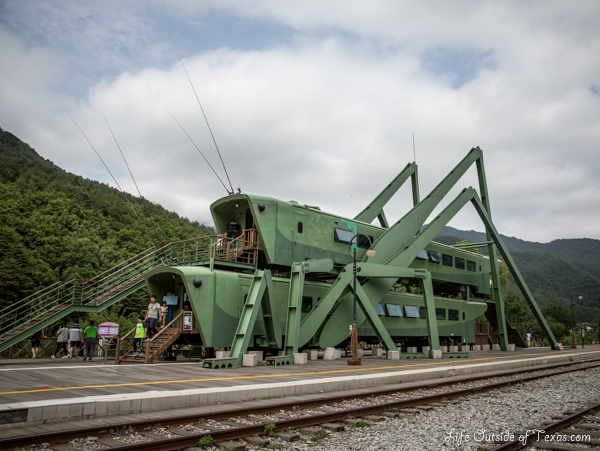 My guess is that the Chuncheon rail bike is your best bet since I’ve heard the subway goes out pretty far that way. 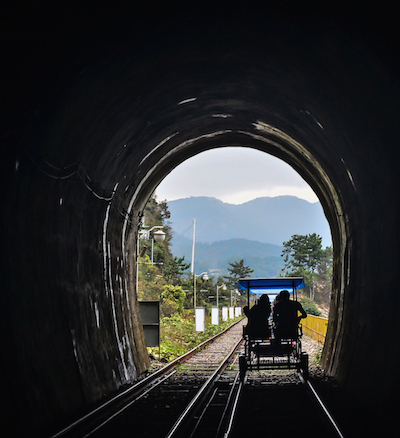 You could also group the rail bike with a trip to Nami Island, which is beautiful (and I have another blog about it if you’re interested). For more options, check out the map at the bottom of the post and hopefully you’ll find that helpful as well. Hope you have a great time rail biking!